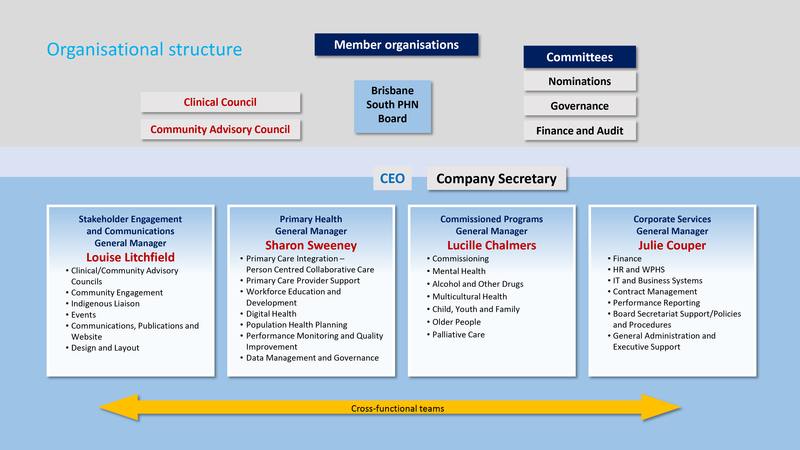 Our organisational structure was adopted to align to our strategic plan and ensure we respond effectively to our purpose of understanding needs, engaging and working within the healthcare system and local communities to improve health and wellbeing. Brisbane South PHN’s Constitution outlines the nature of the organisation. This includes but is not limited to the membership, frequency of meetings, no profits for members, indemnity, insurance, powers of the Board and appointment, remuneration and retirement of directors and the Chief Executive Officer.